Drawing on campus-wide resources, Duke MBA students can complete either of two MBA concentrations related to Energy & Environment, taking classes not just at Fuqua School of Business but also across graduate schools and departments across campus. 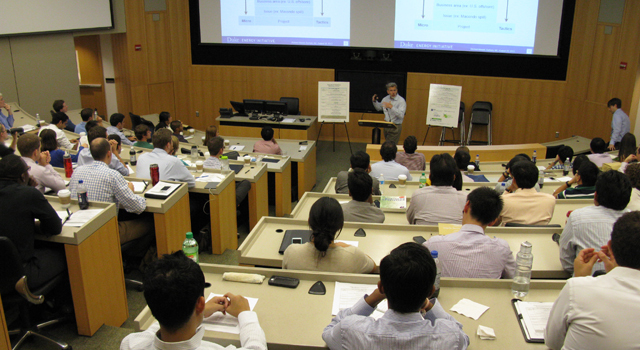 The Duke MBA E&E concentration enables students to enhance their MBA skillset by gaining specialized expertise in corporate sustainability, environmental management, energy science and policy, cleantech/energy entrepreneurship, carbon markets, environmental law, and other topics. Students pursuing this concentration gain tools for analyzing energy and environmental problems, and develop strategies for business to succeed in an economy in which these issues are increasingly critical. Students also gain personal access to a network of global experts in the domain of energy and the environment, as well as a well-established network of Duke alumni in these sectors. The Duke MBA concentration in Energy Finance enables students to dive deeper into issues of project finance, markets and trading, corporate finance, and risk management, with a grounding in the specifics of global energy markets. Students pursuing this concentration take advanced finance courses as well as classes in energy fundamentals. They also have the opportunity to participate in experiential learning projects as part of the Fuqua Client Consulting Practicum program, participate in a host of extracurricular activities, and gain access to a well-established network of Duke/Fuqua alumni in the energy and finance industries.